Designs for the new PGA TOUR headquarters in Ponte Vedra Beach, Florida were revealed to the public today. The new building, designed by Foster + Partners, exemplifies the values of the PGA TOUR by engaging with the surrounding green landscape and creating an uplifting and inspiring environment for its staff, players and visitors alike. Located to the south of the Clubhouse at TPC at Sawgrass, the new 187,000 square-foot headquarters will be nestled within the verdant landscape and surrounded by a large freshwater lake, echoing the iconic ‘Island Green’ 17th hole at THE PLAYERS Stadium Course. Envisaged as the new Global Home of the PGA TOUR, the innovative building embraces new ways of working and collaboration in response to changing media landscapes and audiences, as the TOUR looks towards the future. Over the past few decades, continued growth of the PGA TOUR has forced expansion to multiple buildings with offices spread throughout Ponte Vedra Beach and St. Augustine that is no longer conducive to the evolving nature of its work. 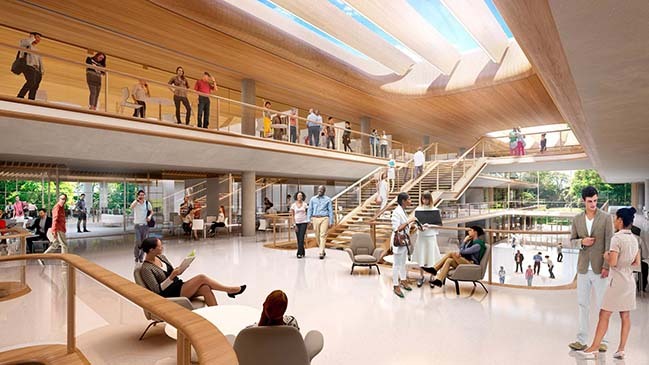 The new building will consolidate all area staff under one roof and embody a sense of openness and transparency, with flexible, open floorplates that are non-hierarchical, focusing primarily on collaboration and mobility at the workplace. 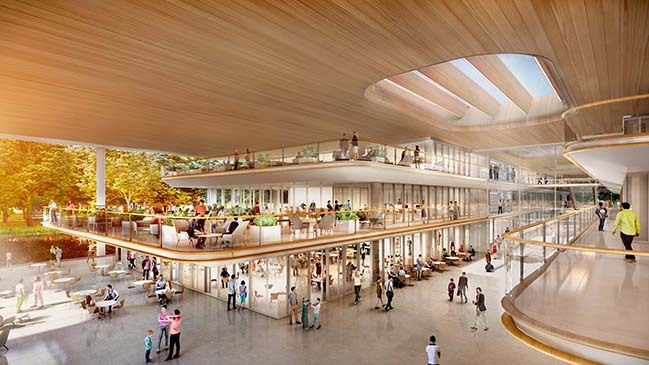 The focus has been on creating a richer experience throughout the building, while preserving its connections with the surrounding landscape and flooding it with natural light and air. Nature plays a key role in the design, which incorporates principles of biophilia – an inherent affinity for nature found in humans – that is proven to enhance staff wellbeing and improve the quality of the workplace. The famous 17th hole at TPC Sawgrass provides a point of axial orientation for the building, which is organized as a pair of parallel three-story bays flanking a collaborative atrium. The glazed façades and atrium fill the building with natural light, also allowing for axial views out to the surrounding landscape throughout. The two building bays are connected by 20-foot-wide bridges that encourage chance meetings, and allow for informal gatherings along the edges, without impeding the flow of people. Similar flexible workspaces are located on the wide terraces along the atrium and the far ends of the building on the upper floor, catering to the need for flexible workspaces to support an increasingly mobile workforce. Allied to the principles of biophilic design, is the sustainable focus of the project, with the building targeting a LEED Gold rating. The roof has five large skylights that bring natural light into the building. Its extended overhang on the building edge significantly reduces solar gain on the glazed façades. 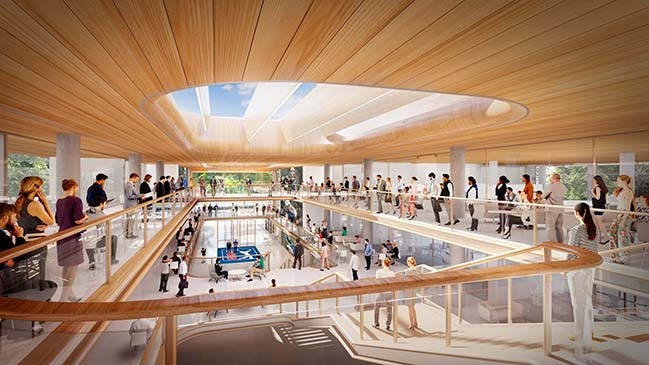 It is also envisioned that the roof will accommodate a series of photovoltaic panels that will support a portion of the building’s energy needs. Employee wellbeing is a central theme with a raised floor that allows for maximum flexibility and premium air quality, site-wide recycling facilities and a 1.3 km running track in the midst of natural woodlands. The PGA TOUR co-sanctions more than 130 tournaments on the PGA TOUR, PGA TOUR Champions, Web.com Tour, PGA TOUR Latinoamérica, Mackenzie Tour-PGA TOUR Canada and PGA TOUR-China. Members on the PGA TOUR represent the world’s best players, hailing from 25 countries (84 members are from outside the United States). Worldwide, PGA TOUR tournaments are broadcast to more than 1billion households in 226 countries and territories in 23 languages. Virtually all tournaments are organized as non-profit organizations in order to maximize charitable giving. In 2017, tournaments across all Tours generated a record of more than $180 million for local and national charitable organizations, bringing the all-time total to $2.65 billion.